Ever been to your favorite restaurant and wished that you could take that flavor home with you? Now, a popular Chinese/Thai restaurant in St. Paul, Minnesota, the Big Bowl, is offering spicy condiments and appetizers at its’ restaurant, local Lunds & Byerly’s grocery stores, and online. 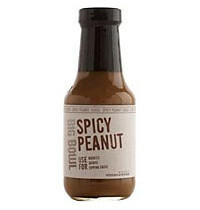 Choose from Spicy Peanut Sauce, Soy Vinegar, Plum Sauce, or Sesame Mustard Sauce, online $5.95 each. Big Bowl Hibiscus Iced Tear online $4.95. Buy all four sauces at Big Bowl under $20. Plus check out their egg rolls, dumplings, and potstickers to warm-up at home. MarkdownMom says: Sometimes, it’s the little things like seasoning that can take an ordinary dish and give it the “WOW!” factor. Always pick-up brand name seasoning whenever possible for your pantry to experiment and use when you cook at home. Great Restaurant Food Cooked At Home For Le$$! Located in the Highland Park Neighborhood of St. Paul, Trotter’s Cafe is reminiscent of small, local, organic restaurants frequented by vegetarians and environmentalists in California. Since 1989, Trotter’s Cafe has been serving patrons with delicious and filling Minnesota-Grown, free-trade, free-range, organic and all-natural food and spices. Food is served according to the hour, with breakfast available until 11am weekdays and 1pm on Saturdays and 2pm on Sundays; lunch anytime after noon; and dinner available after 5pm. All meals are wonderfully priced at under $10 and offers vegetarian and vegan options. Breakfast options include granola with low-fat yogurt, muffins, fresh fruit, oatmeal, pancakes with Wisconsin maple syrup, veggie pie, omlettes, scrambled eggs, apple-cinnamon bacon, and hickory smoked pork links. Lunch includes a variety of sandwiches (e.g. turkey, tuna, veggie cheese, hummus, pastrami and swiss, ham and cheese, grilled 232 foccacia, ham and provolone, and tempeh). MDM’s favorite sandwich is the Chicken Pecan Salad. Also available are tossed green or fruit salads, and fresh soup of the day with home-made bread. For dinner, you can choose from lean buffalo burgers, focaccia pizza, veggie rolls, quesidillas, Tuscany chicken, and more. From the dinner menu, MDM recommends the African Stew comprised of sweet potatoes, cabbage, red onion, and tomatoes in a spicy, peanut ginger sauce, or the Roasted Butternut Squash Pasta made with organic greens, and fresh basil and sage. Bakery and Desserts are available in-store or to-go all hours. In keeping with this atmosphere, the restaurant decor features local artists and local musicians can be heard singing or playing during dinner hours. Service is order from the cashier and bus-your-own trays, although tips are much appreciated! What MDM can really appreciate is their commitment to free-trade, organic, and fresh products, as well as cooking their foods low-fat, seasoning with spices instead of preservatives, and sweetening their food with Minnesota maple syrup and honey, instead of high-fructose corn syrup, which makes for a heart-healthy, diabetes-friendly meal out! All You Can Eat Seafood in the Twin Cities! From the outside, Grand Buffet in Inver Grove Heights/West St. Paul looks like any other ordinary Chinese-American buffet, but inside be prepared to wait in line! Every night is all-you-can eat seafood plus other Chinese-American cuisines, fruit, and desserts for roughly $13 per person. Frequent patrons know to get their money’s worth, skip the rice and noodles and fill your plate up with delicious hot, freshly made clams, mussels, calamari, salmon, crawfish, crab legs, crispy shrimp, and sushi! Drink plenty of water and fruit to clense your palette in between! I’m literally not kidding when I say that the “pros” who’ve been to Grand Buffet before wait near the second to the last aisle for the busers to bring out the tray of crab legs. You know when they are bringing it out when you hear absolute silence right before swarms of people hound the area. I’ve even seen families send their 10-year olds over to fill an entire plate of crab legs or crawfish. After all, who’s willing to mow down a child for food, right? When you go, be sure to tell them that MarkDownMom sent you! Keys Cafe & Bakery is a Twin-Cities family owned restaurant that has been winning awards for its signature breakfasts and comfort food since 1973. Their first restaurant was founded by Barbara Hunn, on Raymond Avenue in St. Paul, where it still stands today. Now with six other Minnesota locations (Minneapolis, Roseville, Spring Lake Park, St. Paul, White Bear Lake, Woodbury) and one in Wisconsin (Hudson), it has won over 175 awards. Now it has been used as the site for a new film directed by brothers, Joel and Ethan Coen. Keys offers signature breakfasts, including Plate-Sized buttermilk pancakes, delicious oven roasted turkey and meat loaf dinner, Minnesota walleye pike, burgers, salads, sandwiches, and soup. Hungry at work? Why not order a box-lunch which includes a sandwich on homemade bread, coleslaw, apple sauce, potato chips, pickle, and cookie. Most Keys Cafe locations also includes a bakery, with fresh cookies, scones, pies, and cakes. Fresh bread, mashed potatoes and gravy, bacon, and more available to bring home. Orders for Thanksgiving and Christmas also available! For Down Home Comfort Food Even Appreciated by Hollywood! MDM Tour of the Twin Cities: Your Breakfast Experience Isn’t ‘Finnished’ Until You Eat Here! The Finnish Bistro, owned by Finnish native Soile Anderson, is a delightful corner restaurant located in the St. Anthony Park neighborhood of St. Paul, Minnesota. As the name suggests the restaurant specializes in Finnish and European specialties. The House Breakfast: Kielbasa sausage and roasted potatoes grilled with sautéed spinach and onions, accompanied by two eggs. Pulla French Toast: Caramelized granny smith apples piled onto pulla bread dipped in egg batter, topped with lingonberries, whipped cream and powdered sugar. Seasonal Fruit Crepe: Seasonal fruit wrapped in a fresh, tender crepe. Ham and Cheese Omelet: Three egg omelet served with salsa fresca, two slices of toast and jam. Vegetarian Omelet: Spinach, mushrooms, onions, red peppers, tomatoes and cheddar cheese served with salsa fresca, two slices of toast and jam. Breakfast Croissant: Grilled ham, scrambled eggs, cheddar cheese and sliced tomato on a toasted croissant. For a light breakfast, you could select from a variety of Finnish pastries (pictured right) from their display case such as cinnamon buns (korvapuustit), jam doughnuts (hillomunkit), or spoon cookies (lusikkaleivät). Also available to take home are home-baked breads and cakes. The Finnish Bistro also has a good selection of soup and sandwich or salad combinations under $10. Most meals range from $6 to $8 and University students receive a 15% discount with valid ID! It’s never too cold for ice cream! Especially when that ice cream is from Maggie Moo’s. Dolled up in her pretty pink dress and pearls, Maggie Moo has been delighting children and adults alike across the United States with her 40+ flavors of super premium ice cream. Other tantalizing treats include Maggie Moo’s Ice Cream Dream Cakes, Deliciously Creamy Milk Shakes, Non-Fat Fruit Smoothies, Sundaes, Banana Split, and Jones Soda and Floats. Other flavors to check out include Red Velvet Cake, Destination Dark Chocolate, Cherry Vanilla Vacation, Chai Tea, Cocoa-Amooretto, Tres Leches, and Pink Bubblegum. And for those calorie-watching folks, Maggie Moo’s offers yummy no-sugar added flavors (banana-strawberry, chocolate, strawberry, and raspberry). Maggie Moo’s Ice Cream and Treatery is the recipient of the National Ice Cream Retailer’s Association Blue Ribbon Award for five flavors: Vanilla, Vanilla Bean, Chocolate, Dark Chocolate, and Strawberry. Maggie Moo’s was also featured by the Food Network for its unique stuffed pretzel in cheese, jalapeno and cheese, and pepperoni pizza! In Minnesota there are three locations: Chanhassen, Maple Grove, and Woodbury. MDM’s associates visited Maggie Moo’s Woodbury franchise located in the Woodbury Lakes Shopping Complex over the weekend and tried the Destination Dark Chocolate with strawberries, almonds, and fudge topping, and Cherry Vanilla Vacation with brownie, maraschino cherries and caramel topping. They reported back that it was one of the most delicious ice cream they’ve had with an enjoyable rush of sugar-filled energy!